I'm Going to Be on Ellen! CLICK HERE TO EMAIL THE ELLEN SHOW! Click here to visit my MySpace page. Click here and nothing happens. Sorry for the delayed post - it's been crazy around here. Below is Joe's segment on the Ellen Degeneres Show. Don't forget to also check out his official site: www.joecameronmusic.com where you can buy his CDs. Be sure to stop the music player at the bottom of this page so that you can hear the audio from the video! We're working on moving the player to a more convenient spot! 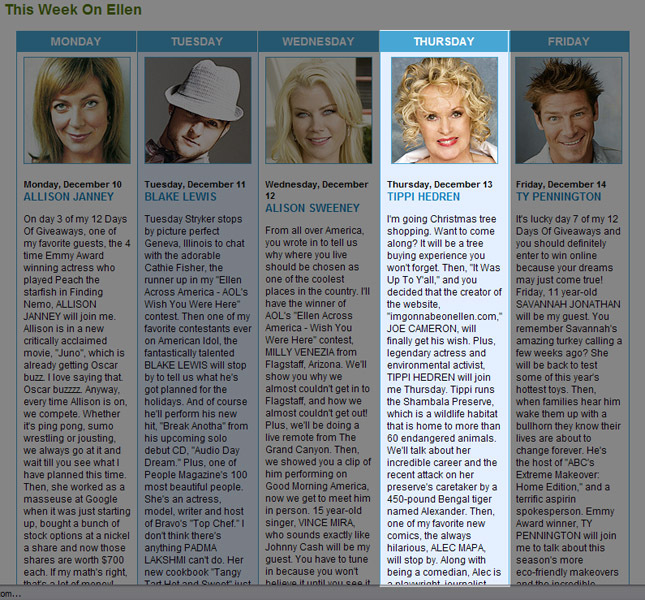 Joe to be on Ellen's show Thurs. Dec. 13th! I just spoke with Joe earlier today and he was at the hotel waiting to be shuttled over to the studio. He flew out on Monday and was taping today. He will be interviewed and will also perform on Thursday's show! Really, this thing could not have happened without support from so many people: the people who helped on the initial stages from filming, to emailing, to calling, etc. all the way to the people who took the time out to vote for Joe on The Ellen Degeneres Show website. It was a landslid victory. It's nearing midnight (Indiana time) and Joe should be calling me soon to tell me how it all went. Crazy. Just crazy. Anyway, around here, he's gotten some media coverage, including WTHR-13 filming him at the airport before departure. I've included a few screenshots of online attention he's received, too. Again, a big thank you to all of you who supported this effort and we hope you continue to support Joe and his career. This has been so fun and the fun, really, has just begun. Stay tuned. In the meantime, why not check out these two screenshots? It is finally REALLY happening! You know when you're shooting pool or messing around in a game of HORSE on the basketball court and you say to yourself, "I'm going to do this behind my back, bank it off of this and that, and watch it go in" - and then it does...and even though you believed it would happen, the sight of it actually happening still gives you that feeling of giddy disbelief? Well, that's how it felt yesterday when part of our original video aired on Ellen's show! Freaking amazing. It's part of a new segment called "It's Up To Y'all" where the audience votes online on whether or not Joe should be on the show. Vote YES and vote often here: LINK. Anyway, below is the edited clip of the show that aired yesterday - including Ellen's introduction!. Be sure to stop the music player at the bottom of this page so that you can hear the audio from the video! A big thanks to all of you who have helped along the way and a HUGE thanks in advance for those of you that will go out and continue to vote. Tell Me What To Do - A Creative Contest! Joe Parodies Ellen's Emmy Song! Joe's Campaign Makes The Newspaper! This is what it's all about...Make sure to pause the music using the player at the bottom of this page so you can hear the video - It's worth it! "I've got a fever and the only prescription is to play live on the Ellen DeGeneres show. See, I'm a singer/songwriter and my band and my music is my career. 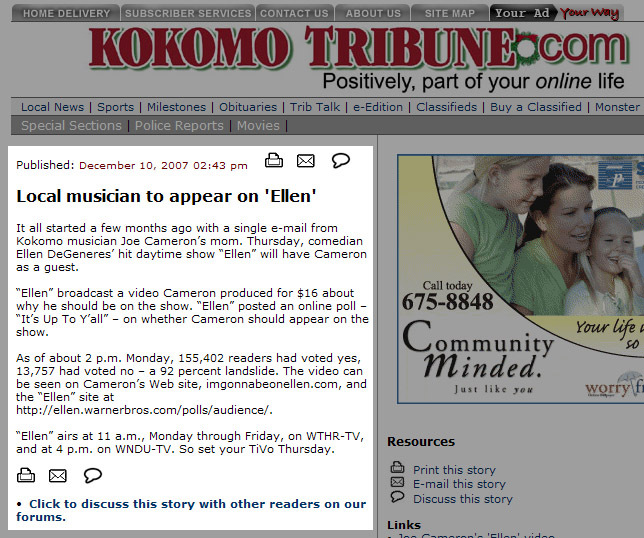 I'm very satisfied with life...with one exception: I haven't yet appeared on the Ellen show. I don't want to be on Leno. I don't want to be on Letterman. There's a hole in my heart however and it can only be filled by playing a song on the Ellen show. First off, thanks to everyone who has written an email to Ellen so far. Keep 'em coming! Now, to update you all on what's been happening lately. At the beginning of August I flew out to Los Angeles so I could sell the furniture that's been sitting in my storage unit for the past few years. I absolutely needed to sell this furniture because I was dead broke. In fact, I flew to LA without enough money to buy a plane ticket back to Indiana. I also went out there to have a meeting with an amazing and very successful songwriter. That meeting went great! But that wasn't the only fantastic thing to happen to me while I was in LA. Let's start at the beginning when I arrived at the LAX airport only to find out that my luggage didn't arrive with my flight. My luggage, instead, was left in Denver and didn't make it on to ANY flight that day. So far so good, right? I call the airline to find out when they will get my luggage and deliver it to me and the lady tells me "maybe a day or two...we've lost a lot of baggage recently." This was Tuesday night. My luggage finally arrived Friday afternoon. So I had been staying on my friend's couch in the same yellow t-shirt (and red stripped underwear) for basically four days. Yummy. If anyone knows LA then you know that it takes *at least* 20 minutes to get anywhere. There is no such thing as "right around the corner" or "just down the street." You don't have neighbors in LA, you have travel buddies united solely by the bond of having the same zip code. It even takes other drivers 20 minutes to flip you off in traffic. Well, I was staying in the Hollywood area and my storage unit and furniture was 30 minutes away in the valley. People were interested in possibly buying my stuff but obviously they wanted to see if first which means I would have to meet people at their convenience at my storage unit. No big deal...except I didn't have a car or any transportation. I would have to borrow my friend's car whenever he wasn't working. Long story short, my first 4 meetings canceled on me via a phone call while I was waiting for them at the storage unit. The first time I did open the unit to show someone my couch, part of my bed frame fell over and hit me in the head making me now look as though I had survived a mugging. So now I'm the guy with the bloody face and head wearing 4 day old clothing acting very desperate to sell furniture out of a storage unit. Basically people are now thinking I'm a homeless criminal selling stolen goods...mostly because of the way I smelled probably. So I get home after this first frustrating day of cancellations and getting acosted by a wroght iron bed frame only to find out that my car had been repossessed the previous night. Shortly after receiving this call, my expensive Palm smartphone fell out of my pocket off a balcony and landed one story below on a hard and ironically freshly watered down surface. Well, at least I could still sell my stuff via the internet, right? Wrong. The internet service at my friend's apartment went down for two days thus paralyzing my efforts. The good news was that after walking around for an hour searching for a coffee shop that offered free WiFi, I had an email from a lady who wanted to buy all of my furniture. I had a friend drive me to my storage unit, sold all my furniture and within an hour had enough cash to get my car back and to buy a flight home. I flew back to Indianapolis the next day. This time my luggage made it with me with one downside however. My Taylor guitar was broken somewhere along the way by the airline luggage handlers. OK, quick re-cap: Lost luggage? Check. Head wound delivered by my own heavy furniture? Check. Wore same pair of undies for four straight days? Checkers. Broken Treo phone? Check. Car repossessed and is now somewhere in Chicago? CheckityCheckCheck. Broken guitar (my only tool for making money)? Checkmate! Be on the Ellen show? Sadly, still unchecked. But don't worry, all is well. ...And remember, let's not do this for me, let's do this for Ellen!"